WASHINGTON — President Barack Obama will establish on Thursday the first national marine monument in the Atlantic, a move that's designed to permanently protect nearly 5,000 square miles of underwater canyons and mountains off the coast of New England. The White House said the designation will lead to a ban on commercial fishing, mining and drilling, though a 7-year exception will occur for the lobster and red crab industries. Also, recreational fishing will be allowed within the monument. The designation of the Northeast Canyons and Seamounts Marine National Monument marks the 27th time Obama has acted to create or expand a national monument. As he prepares to complete his presidency, Obama has made frequent use of the authorities granted under the Antiquities Act, much to the delight of environmental groups but to the consternation of some lawmakers and industry groups. The White House said Obama will make the announcement at a conference in Washington bringing in leaders from around the world to mobilize efforts on protecting the health of the world's oceans. More than 20 countries attending the conference will announce the creation of their own marine protected areas. Supporters say that roping off large swaths of ocean from human stresses can sustain important species and reduce the toll of climate change. But many in the fishing industry worry Obama's actions will make it harder for them to earn a living. "We've been fishing out there for 35 years. It's a big blow to us," said Jon Williams, president of the Atlantic Red Crab Company in New Bedford, Massachusetts. White House officials said the administration listened to the concerns of the industry and pointed out that the monument is smaller than originally proposed and contains a transition period for companies like the one Williams runs. Williams said his company will survive, but the changes designed to address some of his concerns don't change his mind about the merits of the monument. "I think the entire New England fishery is upside down over this," Williams said. 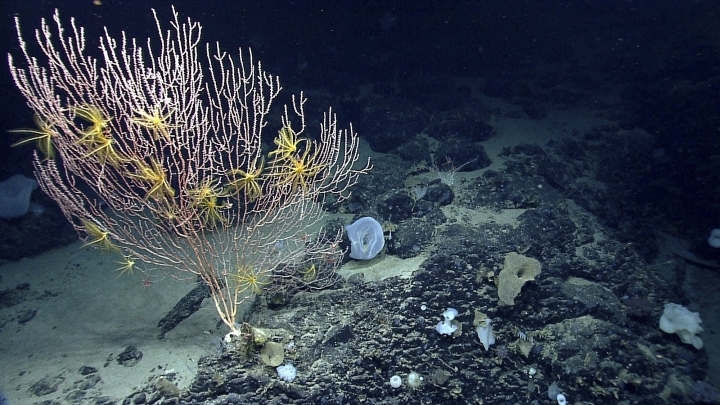 In a memo about the merits of the monument the Natural Resources Defense Council said that the canyons and seamounts within the monument are some of the least fished areas in the U.S. Atlantic, which is a key reason it was chosen for possible monument designation. Other environmental groups also applauded the designation, saying that it was as important to be good stewards of the ocean as it was the land and air. In all, the monument will include three underwater canyons deeper than the Grand Canyon and four underwater mountains. The White House said the monument is home to protected species such as the sperm, fin and sei whales, and Kemp's ridley turtles. Expeditions have found species of coral found nowhere else on earth. The congressional delegation from Connecticut had recommended setting aside more than 6,000 square miles for the monument. Democratic Sen. Richard Blumenthal said Obama had gone with "more sensible boundary limits to the monument" in seeking to balance environmental goals with economic interests. "Jobs are a priority and the monument boundaries better serve that priority," Blumenthal said. Associated Press writer Jennifer McDermott contributed to this report from Providence, Rhode Island.